Life after Petro Georgiou seems to have changed considerably with detention centres running near-emtpy for asylum seekers. But, has it improved? Also published at Margo Kingston's Webdiary, while an edited version appears in New Matilda Issue 53. The recent "adjustments" to the fate of long-term detainees and to children and their families in detention centres have been quite stunning. A recent version of the advocates' network records database, issued in the first week of August shows that there are just thirty asylum claimants in the Baxter detention centre and eight in both Maribyrnong and Villawood. Meanwhile, the Christmas Island centre lies deserted since all the Vietnamese passengers of the Hao Kiet who 'almost' reached the shore in the Port Hedland harbour in 2003 have finally left their Orwellian isolation and almost all of them have been declared to be refugees on a second review. That means that in this caseload the Department of Immigration has a record primary decision error rate of just shy of one hundred per cent. It seems that the massive pressure exerted on the prime minister by the Petro Georgiou group was successful in every way they had placed their demands on the Howard government's policy implementation and practice. Recently my local member the Hon Judi Moylan told me she was assured that all aspects of the demands for change were on track and she expressed confidence and respect for the efforts of Dr Peter Shergold, the chief advisor in the PM's department who carried responsibility for overseeing the implementation of the changes and to arrange fortnightly progress meetings with representatives of the Georgiou group. And from senior human rights lawyers comes a hopeful optimism that the changes to the DIMIA management team and its top echelon are a genuine start to 'coming good' after the exposure of the grave debacles around Cornelia Rau and Vivian Alvarez in the Immigration Department in the Palmer report. The changes in the praxis of mandatory detention did not considerer a central aspect now crystallising into focus after the dust of the pressure of the Georgiou group has settled: it did not address the transitional management of many long-term detainees in the community. This creates for what even right-wing Sydney Morning Herald commentator Miranda Devine admitted to be Australia's 'most potent lobby group' new tasks, new priorities, and new demands, and they may well be overlooked by most observers. Overlooked, because already the army of refugee supporters who have all 'their friends' leaving detention, is going quiet. 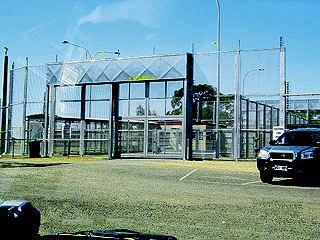 Those who solely concentrated on being visitors to detention centres may well feel as if they're out-of-work on the weekends, and if they did not also work to establish their roles as fierce advocates for political change, they're simply left with the choice to not support the Howard government when voting at the next federal election. And the general public may now well say that the horrors of long-term detention vanished: the almost daily reports of the agony of detention centres are rapidly thinning from their usual corners on the pages in Australian newspapers. What is unlikely to be overlooked by refugee welfare and care centres though, is the fact that they're suddenly not just looking after people in the usual way, busy-bodying themselves with arranging resettlement services and inroads to education and integration into Australian society, but that the number of clients on their listings who are in a deep state of shock and who show severe symptoms of post-traumatic stress disorder has increased considerably. What is emerging in these circumstances is the complete absence of policies of statutory after-care now that long-term inmates of the refugee prisons have gained their freedom and visa. Several cases of refugees who have ignored or refused to connect to refugee support centres are surfacing; this while their life-style shows all the signs of an inability to settle. Some have suddenly, at times without warning or announcement, abandoned the generous and free host-accommodation homes, often in top-ranking mansions with ample room, offered by well-to-do retired people, and they are known to criss-cross the city in which they landed after detention, sleeping here, sleeping there, restless, refusing job offers for reasons trivial to us, and more seriously, refusing any forms of support, guidance by agencies and counselling. Two liberated Baxter inmates plead with their support worker to be taken back to Baxter - because it's the trusted and familiar routine, and a lot less scary than living in a city. Another refugee tells a selected number of friends that 'all Australians are stupid', and a third one plans to abandon all the services, education and tutoring he has received in a major city and phones a letter-writing family he's met just once, living three-thousand kilometres away, that he wants to come over to live with them. Australia's harsh measures of keeping people locked up 'forever' have permanently damaged hundreds of people and broken their trust in what Australia has to offer and the confidence in a belief in their own ability to engage with and in society on the deepest level of their being. Demand for life-long psychiatric and psycho-social support services for the long-term detainees was not a part of the Georgiou deals. Just like Australia ignores life-long support for those in the Aboriginal community whose broken personal cultures and lifestyles - damage entirely due to the encroachment of white culture in their regional areas and its violent superimposition on Aboriginal culture - have driven them into alcoholism, Australia ignores that the policies themselves are to blame for the fact that we owe it to the political prisoners of Howard's attempt to win the 2001 election to have a full program of restorative justice, no matter what it costs to the budget. Compare this with someone leaving jail after a five-year sentence: an all-compassing, close-knit network of support and transition services comes into operation when the jailhouse door closes behind someone completing a prison term, and a casework plan stages all aspects of life for a former prison inmate, with support services and case workers, counsellors and career guides in place, so the change of failure after the term of incarceration is all but eliminated. In this it is acknowledged that institutionalisation is one of life's most damaging forms of psychological abuse, and that incarceration behind bars has a seriously damaging effect on one's social persona - and that is for those who according to western society's 'code', deserve it because of what they have done. Yet, we lock up refugees for five or six years, all the while denying they're refugees, until they are out, suddenly declared refugees (as is the case with most of the about 120 Baxter inmates released since January this year) or set free without any dignity or celebrations, yet we do not mandatorily offer them a formalised network of support services helping them along. And, there's another thing, easily overlooked. Think of the little girl who lived in Woomera, who asked whether flowers grew at all in Australia. Those recently released from Baxter may have been "amongst us" for five, six or seven years, but they have never been in Australia when it comes to it - and suddenly we throw them out on the street. It seems that only Australia's border protection policies were drawn up on a no-matter-what-it-costs designers' drawing table, while John Howard remains mean and tricky when it comes to assisting those he tortured to recover. The costs of permanent detention are still borne by its victims - they are just less visible to the media now that they're likely to loose a central interest in the fate of those who bore the brunt of our Orwellian policies - reducing the issue to the odd refugee case study. Meanwhile, on July 21 Australia's Governor-General signed off on changes to the excision regulations and two detention centres are being built in the Northern Territory at Gove, and on Horn Island - outside the migration zone - and it shows that Howard has no intention of changing any of his policies. As I write this, a motion by Democrats' Senator Andrew Bartlett to disallow the excision of thousands of islands from Australia's migration zone has just been defeated along party lines. Perhaps that's a good thing. If you're close to retiring you can now have your sea change and move to Groote Island, Melville Island or Magnetic Island and feel pretty safe. At least, you'll never meet an Immigration officer or a staffer from the Department of Immigration, who may lock you up or deport you to an unknown destination because you have an Un-Australian accent. DETAINEES are being released from detention centres with so little preparation for life outside that some have asked to be returned, according to two refugee workers. This week an Iranian man, released three weeks ago after five years' detention at Baxter detention centre, returned to Baxter and asked to be readmitted, said lawyer Kon Karapanagiotidis, director of the Melbourne-based Asylum Seeker Resource Centre. "He was told he can't be readmitted," Mr Karapanagiotidis said. Another centre co-ordinator, Pamela Curr, said the man had been "dossing down" wherever he could find space and had not been able to afford to rent a place. An Immigration Department spokeswoman confirmed that the department could not take back former detainees. Another recently released Iranian man, in his late 20s, wanted to return to Baxter last week, but advocates had talked him out of it, she said. The man was "wound up" after he was unable to meet $220 weekly payments on a flat he took with another detainee. When the other man was required to take a country job, the agent told him he was "blacklisted". "A couple of others have said 'I feel like I want to be back in Baxter. At least I know what will happen there'," she said. "All these people have seen for up to five years is four walls and a stretch of sky and they are coming out geographically isolated and mentally ill.
"They get lost easily and it destroys their sense of self." Mr Karapanagiotidis said: "We're seeing this huge crisis where most of the people we've seen over the last three or four months - people who have been in detention four or five years - are coming out so institutionalised and so damaged." He said detainees are often released with just two hours' notice, given a bus ticket and $200 to last two weeks. "They have been released, often at the point of being suicidal, severely distressed and suffering post-traumatic distress. We've finding people turning up at the (asylum) centre who are homeless, they have no access to Medicare or Centrelink even though they are entitled, because they have no idea of how to access those services." Mr Karapanagiotidis said the Government was failing in its duty of care and was discriminating by denying services to temporary visa holders. In contrast, families and children released last month were given access to a Red Cross resettlement case worker with a pre-release assessment of their needs, and transitional housing. Those with permanent visas are assigned a settlement worker who provides support. Ms Curr said the asylum centre was urgently seeking a large residence to run as a half-way house for former detainees. The department spokeswoman said detainees have access to TV and papers, and officials can advise them of entitlements. As a number of long-term detainees have been released from detention onto Temporary Protection Visas in the last few months, many of who had spent four to five years in detention, the ASRC is seeing first hand each day the damage done and the human cost. We are finding men who are severely traumatised, presenting with post traumatic stress and depression and struggling to cope. We are consistently find these men to be in crisis once released as whilst they are entitled to Centrelink, Medicare and the right to work, they are denied by our government access to any settlement services or Migrant Resource Centres. This is resulting in some people becoming homeless, living in the community with no income or Medicare as they don't know how to access Centrelink or Medicare. We are finding asylum seekers sense of despair and hopelessness growing the longer they are out because of the absence of the intensive settlement support that they need and the pain and uncertainty caused by being on a TPV. We even tragically had someone so traumatised, institutionalised and broken that they tried to getting re - detained in Baxter Detention Centre, having just been released a month earlier after five years of being imprisoned in there. The Federal Government needs to act now as a matter of urgency to grant people coming out of detention access to refugee settelement services and also end our TPV regime and grant all TPV's holders permanent protection. A human rights lobby group says some released asylum seekers have been pleading to be taken back to the Baxter detention centre in South Australia because they cannot cope with life outside. Project SafeCom says the Immigration Department has made enormous progress by releasing children and their families from immigration detention. Spokesman Jack Smit says there is no policy of mandatory resettlement, so many freed asylum seekers are not taking advantage of trauma counselling and other services. He says some people just do not know how to cope. "For five years we lock them up and suddenly we tell them you're a refugee and we throw them on the street," he said. "So people have been begging, 'please take us back to Baxter because I'm scared and I don't know how to do this'."